• It’s been a period here of working nearly around the clock to get some of the Thunderbean projects finished; Fleischer Rarities is still receiving some extra treatment to make the material look as good as possible. I’ll be talking a lot about this set this next week. It really needs to get out the door by the end of the weekend at least, so it’s a dash to improve what I can and have a set that I’m pretty happy with. By the end of the each project, I always feel different about the films than I did going in. Everyone working on the cleanup sees the animation frame by frame. One of the coolest things is seeing the thought process through the drawings of the animators. When you have a print that has a good amount of damage, doing all the cleanup manually doesn’t work very well, and requires aggressive passes of automatic cleanup (often two or three). The digital restoration programs compare frames from before and after the particular frame that needs to be cleaned up, and fill in information missing from the frame. 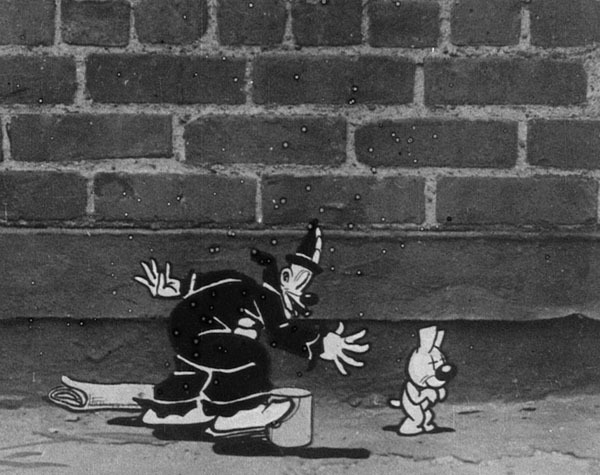 With animation or fast action (in live action), it’s much harder since the program, comparing frames, often thinks the lines around the characters are dirt and removes them. This requires going back to the frame and manually putting things back in. 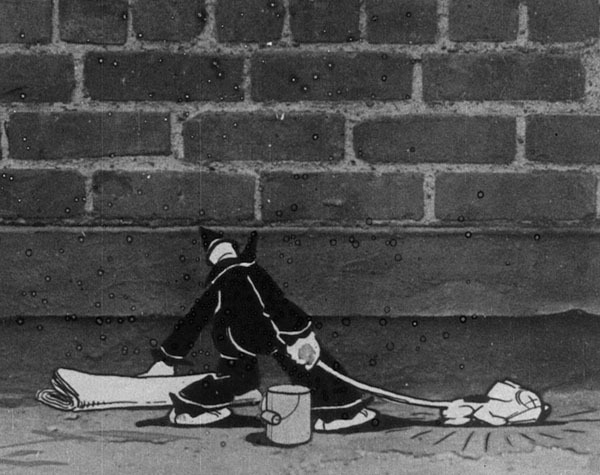 One of the shorts on the Fleischer Rarities set, It’s the Cats is from a rare 35mm nitrate print. It has its flaws, but even with the flaws, it’s a beautiful copy of the film, and I’ve enjoyed working on the digital cleanup- although it was pretty slow going through this particular film. • It’s been an equally enjoyable experience to work on the Flip the Frogs, although in different ways. Working with materials in excellent condition overall is really nice in that it doesn’t require spending as much time in manual cleanup frame by frame, and that’s always a good thing. The fine grain materials on the Flips are often nearly as beautiful as the negatives, and much more complete. We’re scanning the negs that exist anyway, since they deserve to be preserved in their full quality since they’ve been lucky enough to have survived this long. We’ll be working on getting the last of the films scanned in the coming weeks for this set, and will be posting more pictures as the sent is finished. • Rainbow Parade corner: This week, I was lucky enough to win an eBay auction for a rare print of Parrotville Fire Department, the second of the ‘Rainbow Parade’ cartoons. It’s a pretty hard one to find, but what was especially cool about this print is that it appears to be in nearly mint condition – in 35mm! I’ll post stills when it’s scanned. We had previously scanned an also very rare 16mm print of the film, and recently a collector in the UK lent me a really nice super 8mm print of it, also with original titles. We’ve been working a lot on the Rainbow Parade set as this film turned up, so it’s happily been added to the elements that have started to be scanned. We’re still looking for original titles on some of the shorts, so, I thought I’d put a call out to the collectors here just to see if anyone has (or has heard of) a print that exists with with original titles on any of the following. If you do please let me know! 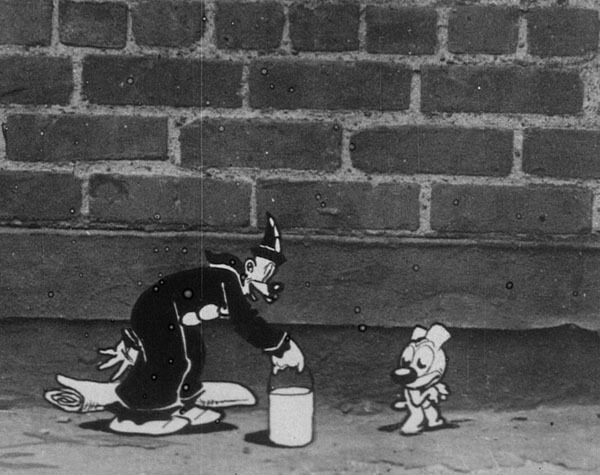 Pretty frequently when I’m working on cleanup on these projects, I’ll put on a soundtrack to a vintage cartoon. 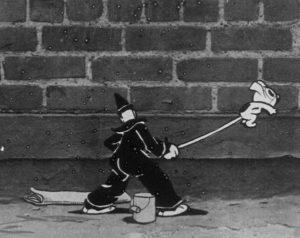 Van Beuren’s Opening Night was one of the shorts this past week that was playing while the Fleischer shorts were getting some extra scrubbing. I think it has an especially good soundtrack, and is one of the best of the Cubby Bear cartoons. Here’s the version that appears on the Thunderbean ‘Cubby Bear’ Blu-ray. One of the prints used for the set had a few fade out frames of the ‘Radio Pictures’ logo at the beginning, something missing from every other copy of the Cubbys I had seen – so it was clear that it was on at least that film originally. This version includes the Radio Pictures title, very likely pretty close to how it originally appeared, at least on the early shorts in this series. The print used here is courtesy of the Tommy Jose Stathes collection. Steve, your work on restoring these cartoons is always appreciated. Thank you!! Yikes, does that mean you’re using DVNR to clean these up?? :O Because those symptoms (mistaking drawn lines for dirt) sound exactly like it. It’s not the old DVNR of yesteryear, but all digital restoration programs work in a similar way. The big trick to doing a good job is care- and that requires a lot more time than it would take to just slap on the auto passes. I think we’ve ended up with pretty nice results, but it’s a bunch of work! Oh boy, do I wish I could help with information on the titles you have put a call out for. These are so rare that I don’t recall seeing ’em when I did actually see the Van Burens on local TV years ago. In fact, I grew up thinking that there were only a small amount of Van Buren cartoons. The CARTOONS THAT TIME FORGOT set on laserdisk proved me wrong, but even some of those shorts had makeshift titles fastened to them so as to look complete. It is for that reason why I look forward to this set, because I’m sure there are bits of scoring that haven’t been heard in decades. I wish you luck on this equally frustrating and rewarding search. And I’m giddy that the FLIP THE FROG masters are in very, very good shape, overall. As I’ve said before, this set will be perhaps the most welcome out of projects that I’m looking forward to receiving sometime this year(? ), and I can see where fast movement would be tough to clean up, because, especially in live action, there are times when the camera reads the action as a blur–how do you “clean up” that kind of action, especially if under-cranking has been used? 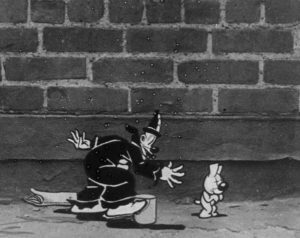 Animation is, I would assume, a little easier since there are often streak lines to emphasize action, and I know that Warner Brothers cartoons used this technique often. I’m not as sure about MGM titles since the detail per frame is far greater. Regarding animation linking to live action, I always remember hearing that animating Jerry Mouse performing the same steps as Gene Kelly in “ANCHORS AWAY” was difficult because some of Kelly’s steps blurred when examined frame by frame. How do you mark the perfect timing of that without “cheating” a little? And I know that this title is not among anything that you’re tackling, but when you’re dealing with a cartoon, say, as detailed as “CIRCUS DAZE”, where you’re not only aware of action center stage, but you’re also aware of action being overlayed across that center stage chaos, well, if you are fully aware of this cartoon, let me just say that the cleanup process must be almost as nagging as the animals’ reaction when being attacked on all sides by the escaped flea circus swarm!! I unfortunately never had the amazing opportunity to examine such a cartoon frame by frame, but let me just say that, some surrounding overlayed action almost makes it look at times as if there is snowy interference similar to that which one used to get on television screens in the 1950’s and 1960’s–makes me dizzy just thinking about single scenes of mere seconds, and I’m sure that the afore-mentioned BOSKO cartoon from the MGM HAPPY HARMONIES series is not the only example of what I’m talking about! What are the dots to the left of the sprocket holes? Decades later, Sony Dynamic Digital Sound (SDDS) used that area for their sound information….. but what’s going on here? 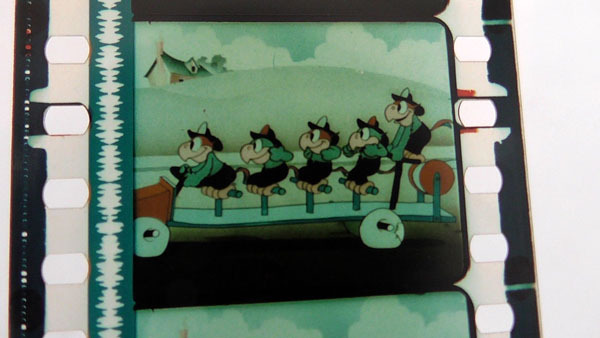 It’s rare to find a nitrate 35mm print of a golden age era cartoon listed on E-Bay. That this title should show up as you are nearing completion of your Rainbow Parade project was astoundingly good luck! Looking forward to seeing the definitive Rainbow Parade BluRay release, but wondering if you’ll choose to use the re-issue titles / Commonwealth or Gutlohn) for those you can’t find ? It was fun working on cleaning up “Opening Night!” Hopefully I’ll get the chance to help out again during spring break! How exciting to get that print of “Parrotville Fire Department!” I can’t wait to see it and the rest of the Rainbow Parade cartoons cleaned up. I wish I could help you out, but I’ve just started collecting 16mm film myself! Hey Scott! Thanks for the work on ‘Opening Night’- it came out really nice! Thanks also for the continued support of these things as well as friendship! Glad to hear you’re collecting film as well! 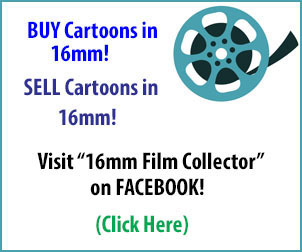 Check out the 16mm forum as well as the ebay list- I’ll be listing some cartoons there! Congrats again on winning the Parrotville print! Hope your search for the remaining missing titles prove fruitful. Glad to hear progress chugging along on the new sets, looking forward to all of them of course. Hope to see more stills as the sets edge closer to the finish line. Does anybody know the meaning of the text “COLORED BY BROCK” that appears for a couple of frames in the credits of “Opening Night”? I just slow-motioned it and saw it. I must know – what did Brock color? 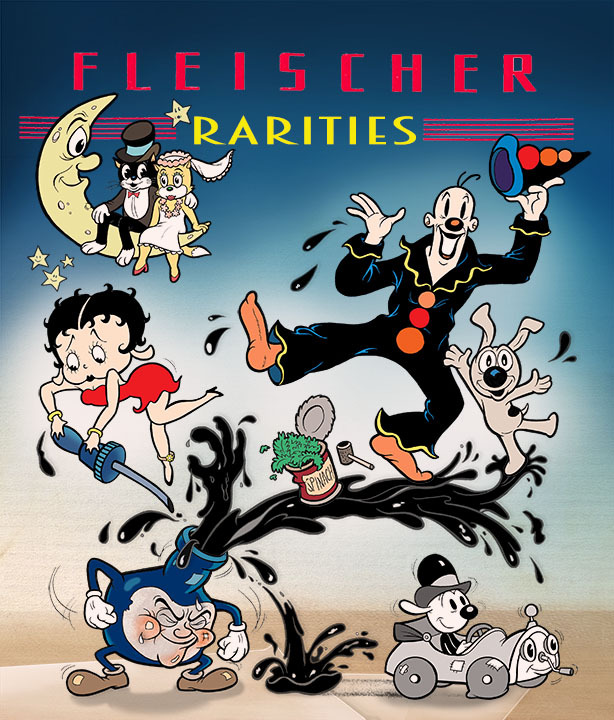 Who did the cover for “Fleischer Rarities”? I don’t remember if you mentioned the artist here before. Actually Steve mentioned it when he first posted it two weeks ago. The cover art is by Dragan Kovacevic and Antea Ratkovic. “The 2 words that I understood were ‘guaglione’ and ‘fesseria’. Guaglione means boy in Neapolitan and fesseria means hogwash! 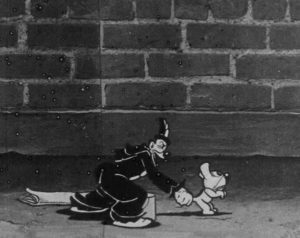 By the way, hats off to you and Tommy for finding a print that indicated Van Beuren cartoons originally included a full RKO “transmitter logo.” Many of the earlier Pathe’ releases still include a logo due to Pathe’s unusual habit (a holdover from the silent days and a precursor of the TV era!) of putting their logo at the end of the picture rather than the beginning.